Utilities began dispatching lobbyists across Capitol Hill last year to preserve the federal electric vehicle tax credit and build momentum for other transportation electrification measures, even as they largely avoided political fights over those issues. Those efforts would run head-on with conservatives who have the ear of President Trump: The president's proposed budget seeks to eliminate the tax credit and gut funding for two offices that lead clean transportation research. Such are the details emerging from lobbying disclosures filed by nearly a dozen of the nation's largest investor-owned utilities, as well as the Edison Electric Institute, an industry association. The documents suggest the electric sector is becoming an increasingly active — if still conflict-averse — player in an ongoing contest between pro-EV industries and oil and gas interests, which have pushed model legislation condemning subsidies and lobbied Congress to end the $7,500 tax credit that drivers can claim when they buy a plug-in electric (Climatewire, March 4). Utilities have made their case publicly, too, in letters to Congress asking lawmakers to eliminate the 200,000-car cap on manufacturers' EV sales, beyond which the credit phases out. But they're also happy to let automakers lead the campaign to preserve and extend the tax credit (Energywire, Feb. 7). "When you think about it, we're kind of like an ancillary, second player in that," said Brian Wolff, executive vice president for public policy and external affairs at EEI, on the sidelines of an association event in February. "It's really the [original equipment manufacturers] and car manufacturers that have to come together to do that." In the second half of 2018, EEI paid its in-house lobbyists over $3.8 million, listing over 40 laws and bills and 19 policy issues on its fourth-quarter disclosure form. It began lobbying on the EV tax credit in the third quarter, according to filings, along with the "Electric Credit Access Ready at Sale (CARS) Act," a bill introduced in June by a group of Senate Democrats led by Sen. Jeff Merkley of Oregon that would remove the 200,000-sale cap on the credit. In the last three months of the year, it also took up the "Zero-Emission Vehicles Act," which would require all new vehicle sales to be zero-emission by 2040, as well as reauthorization of the Fixing America's Surface Transportation Act, an existing law that helps cities fund the purchase of low- and zero-emission fleet vehicles. Other EV-related policy items listed by EEI were vehicle fuel-economy standards, and draft laws related to funding for alternative fuel infrastructure. The documents suggest utilities are doing more behind the scenes than just playing defense on clean transportation policies unpopular with the Trump administration. Wolff told E&E News in February that apart from supporting the tax credit, the association was talking with "Green New Deal Democrats" about carbon reduction in the transportation sector. "I think what we're doing is really setting the table for 2020," he added. Of the dozen other utilities and utility-inclusive associations whose disclosures were reviewed by E&E News, six listed the tax credit or legislation that would extend it as a focus of their lobbying efforts. Only one of those six had done so before last year. In the second half of 2018, three of the utilities — Exelon Corp., Southern Co., and Pacific Gas and Electric Co. — also listed either the "Electric CARS Act," the "Zero-Emission Vehicles Act" or both. Several of the utilities announced new EV programs last year, though not every company was active on the Hill. One of them, Public Service Enterprise Group (PSEG), wrote in its filings that it had lobbied on "draft legislation related to electric vehicle deployment and related infrastructure." But Fran Sullivan, a spokesperson for PSEG, said staff hadn't yet "zeroed in on a specific electrification policy priority" at the federal level, noting the utility had presented regulators with an $364 million EV program in New Jersey. Five of the utilities reviewed made no mention of EVs or transportation electrification in their filings. One of those utilities silent on the issue included Dominion Energy Inc. A spokesperson for Dominion said the company was nonetheless "making plans to support electrification," including working with EEI on the development of its position. "While we did not lobby on specific issues under consideration in Congress in the 4th quarter," it said, "we have been talking to Congress about possible federal EV policies in the first quarter which our upcoming report will reflect." The reports give a snapshot of growing activities in a year that saw EV sales increase by more than 80 percent in the United States. Energy policy analysts, including researchers at the National Renewable Energy Laboratory, see an electrification of transportation as the power sector's best growth opportunity, far outweighing the electrification of home heating and other sources. Most of the industry holds that view, as well. But until last year, many utilities had been reluctant to pursue programs that would support EV deployment. One report published last spring by the Smart Electric Power Alliance (SEPA), based on 2017 data, found that the sector had "generally taken a conservative approach to electric vehicle (EV) deployment." That changed last year, thanks in part to encouraging sales numbers, said Erika Myers, principal of transportation electrification at SEPA, whose members include utilities, grid managers and various clean energy industries. "There were a lot question marks around whether the technology was actually going to be deployed at large scale," she said. "Other priorities tended to get to the top of the pile. But I see that shifting." 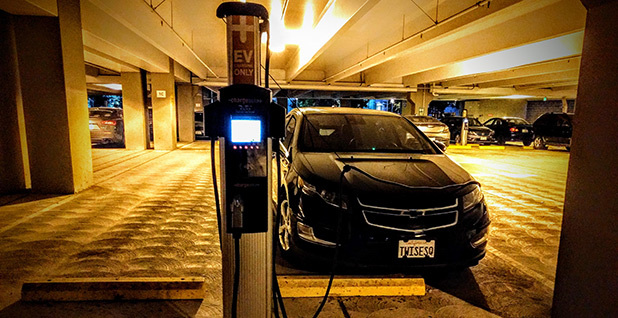 Interest from utility commissions, customers and other groups in the energy world, often locally and at the grassroots level, was encouraging utilities to come up with new EV programs. "We're starting to see this momentum building," Myers said. Correction: An earlier version of this story listed Erika Myers as the director of the Smart Electric Power Alliance; she's the principal of transportation electrification.